If book lovers love anything more than books, it's showing their love of books. Another trait of bookworms, we (yes, I include myself) tend to own some volumes that have seen better days, yet we just can't bring ourselves to toss them. There's a jewelry-making solution: upcycling book pages. Whether you want to immortalize your own favorite titles, create gifts for bookish friends or provide designs to this well-read demographic, here are six ways to create fun, book-inspired jewelry. 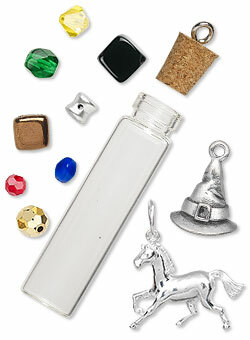 Clear glass bottles with stoppers and a loop are perfect for sending the message of a favorite book, chapter or line. Cut a strip that fits inside the bottle and seal it up. String cording or attach to chain with a jumpring and the existing loop. This loop also provides extra embellishment opportunities for incorporating charms or other dangles relevant to a plot, character or theme. Think horse charm for Black Beauty or maybe a wizard hat and a beaded dangle in your preferred house colors for a Harry Potter title. If you're not afraid to cut pages a little more, choose a phrase, character name or word that stands out and cut it to fit a bezel setting. Use a glass cabochon to cover or use Magic-Glos® (be sure to seal the paper by covering it with regular clear tape first) to fill in the mount similar to Jamie's pendant necklace design B87W. Choose two smaller mountings for earrings and a larger variety for a pendant and combine as a set. Wear your heart on your sleeve and a book page on your wrist. Deep Flex™ bangle molds allow you to create bangle bracelets using resin. Add multiple strips of paper or cut a long strip to go around the whole circumference. 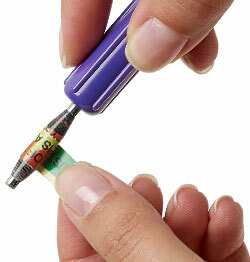 Seal the paper you use by covering it first with clear tape to protect it. 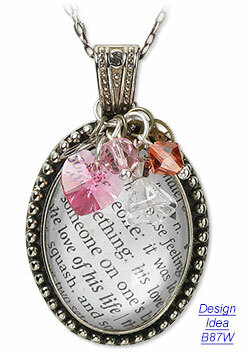 Add layers, glitter, dye or other relevant charms and beads. There are other molds to use as well, creating focal components and more in shapes such as rectangles, hearts and teardrops with book page clippings and resin. If resin isn't up your alley, try sandwiching a page between two glass slides and soldering the edges closed like in Tammy Honaman's art glass necklace. With the help of tinning techniques, sometimes compared to stained glass, the paper you choose is secured with adhesive foil. For complete instructions on this hot technique, follow the detailed instructions in the how-to ''Tinning Copper Foil''. Use more of each page by creating your own beads. Using the paper bead roller and strips of book pages, create a design that tells a new story: one of bibliophile fashion statements. Depending on the shape of the strip you cut, the bead will turn out differently. After you have all your fun-shaped paper beads, make sure they last by applying a sealant such as Mod Podge®. For full instructions, and a helpful how-to video, reference ''Making Beads with the Paper Bead Roller'' presented by Tammy Honaman. Again, add any other relevant embellishments that capitalize on a book's theme. Is one of your favorite books a volume with a significant symbol, such as One Thousand Paper Cranes by Takayuki Ishii? Folding paper, including origami, is an excellent way to bring a symbol to three-dimensional life. You'll want to seal any creations with Mod Podge and probably keep these creations to designs that won't see a lot of impact, such as earrings. For more suggestions on how to use origami in your book-related jewelry, read our ''Style Snapshot: Origami Paper Art Jewelry''. 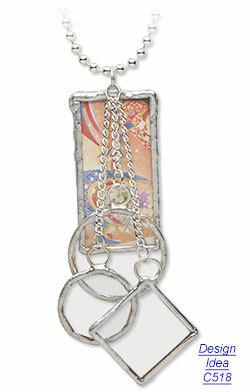 Spread the joy of reading with jewelry inspired by favorite books. We can't wait to see--and read--these designs!